First, let's investigate the properties of an orbiting body. In the following graph, the green ball represents the Earth rotating around the (red) Sun, which is at a focus of the ellipse. This is greatly exaggerated so you can see what is going on. Many of us don't take much notice of the motion of the sun, moon or planets. (Let's face it - most of us live in places that have bad air and light pollution so we can hardly see the sky). Consequently, we assume the Earth's motion around the sun is uniform and that it takes exactly 24 hours for the sun to come back to the same spot above us each day. But this is not so. There is as much as 30 minutes variation between the position of the sun relative to the stars at the same time of day, throughout the year. That is, the sun can be "behind" by as much as 14 min 6 sec (around 12 February each year) and up to 16 min 33 sec "ahead" (around 3rd Nov each year). The Earth revolves around the Sun along an ellipse, not a circle. As we saw above, this means the Earth does not travel around the sun at a constant speed. If the Earth rotated around the sun in a perfect circle and there was no tilt on the Earth's axis, we would see the sun overhead in exactly the same position every day. The ancient Greeks knew about this issue but because they didn't have accurate clocks, they were not too concerned. By the 17th century, with the invention of pendulum clocks, knowing where the sun should be at any time of the year became critical for accuracy in navigation at sea. The Equation of Time takes the above 2 factors into consideration and can tell us how far ahead or behind the sun will be relative to the stars. This contributes 7.655 minutes to the Equation of Time, and the period is 1 year (365.25 days). The Equation of Time is a neat real-life application of conic sections (the Ellipse) and Composite Trigonometric Curves. See the 40 Comments below. Now if graphed, your equations would match the given graphs. Thank you very much for the equations and the descriptions. I am teaching a trigonometry class and we are building a sundial for our final project and this site was very useful! I actually just checked the calculations and I now notice that they must occur in degrees with a window of 2pi which then makes the current equations correct. Sorry for the false correction. @Max: Thanks for the correction. All the best with your sundial project! Your graphs for the separate components of the EOT are backwards. 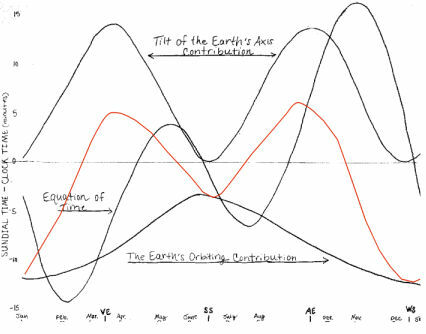 The upper graph is for the obliquity of the ecliptic (tilt) and the lower one is for the eccentricity of the earth's orbit. Not too serious but very confusing. @Tom: Thanks for the feedback. You were right - the order should have been reversed for better clarity, so I did so. I also added some other information for better accuracy as regards the period. Your formula has a maximum for d = 301, this coincides with October 28th. But this maximum has to be reached on November the 3th (or 4th)! There seems to be a shift of a week! Hi, Murray, thanks for your rapid response. What am I doing wrong? Thanks for your patience! Perhaps d is not the day of the year, but the number of days after the perihelion (4/5 January). Your depiction of how the two components contribute to the equation of time is incorrect. If you will send me an email address I will send you a paper explaining the new correct understanding. Thank you, Alan, for your insights. Will they now change the depiction of how the components contribute? @Alan: I believe my article incorporates the conventional components for the equation of time. Your paper introduces another perspective, so I included the link to it. Readers can decide which is the most appropriate one to follow. That's fine. By the way do you have any problem with my analysis? Both can not be correct. As mentioned in my article, the components given are a "good approximation" for the equation/ Your final curve is roughly equivalent. I'll try to have a closer look when I find some time, but in the meantime, I invite discussion from other readers. That's fine, I assume you'll let me know the result of your review. No Rush! I have no question of the Equation of Time plot it is only the component curves that I believe are wrong. I am afraid I'm no help to you. As I say below the figure, the ET plot has been made to scale. The curves for the contributors to the ET depict all that is currently known about then. Namely their general form and the times through out the year when they are at their maximum and minimum values. Maddie's comment reminded me I needed to have a look at your analysis a bit more closely. I checked your resulting curves once more and I don't believe they add together to give the Equation of Time. I placed a grid behind your Figure 2 and added the ordinates of the two contributions (the reddish curve) and found the result was along way from the actual EOT curve. Do you have equations for those curves? I did those curves at a dinning room table. My hands are not the most stable things so I actually had my grand daughter help me with them. They were meant to be representative not mathematical measuring tools. I do not have any equations for those curves. Anyone trying to establish meaningful equations should also make sure they are knowledgeable of my discovery and the correct value of the tip angle of the earth. To understand what I am saying go to "Alan,s Discovery' on you tube https://www.youtube.com/watch?v=EFlzzm_sE3Y . What I explain can not be seen from a geocentric perspective! So astronomers and astrophysicists can not not comprehend what I am explaining. @Alan: I wasn't criticising your curve drawing at all! My point was that if your analysis concludes with those 2 curves, and they don't actually produce the Equation of time, then they are probably not the actual components. No one disagrees that those are the proper components. The manor the manor in which each contributes is were we differ. As you know my paper explains the new understanding which is done from a heliocentric perspective. How come our earliest sunset at 7 deg N. Lat. is on Nov 12? @Alfred: To the nearest minute, the "peak" lasts for just over 2 weeks (as does the trough), so Nov 12th is within that peak period. I was just wondering how you got the value of -3.588 on the second graph. I know that this is the horizontal translation, however I cannot understand how to get that value. Please explain. @Chloe: If you observe the graph of that second component (the blue dotted curve), you'll notice it is a sine curve that has been shifted a certain amount. That is, it does not go through (0,0) but has been shifted to the right. See Graphs of y = a sin(bx + c) and y = a cos(bx + c) for more on phase shift. @Murray Do you agree with the fact that the earths orbiting the sun can only causes the time to get from one high noon to the next to increase? Compared to a fixed position of the earth with respect to the sun. No. I really do mean that the earliest sunset at 7 deg N. Lat. is November 12 -- to the nearest second! The softwares that calculate sunsets all show that the sun sets Nov 11, 12 & 13 at 17:31:31, but on Nov 10 at 17:31: 32, on Nov 14 at 17:31:33, and on Oct 31 at 17:32:36. What I am after is an explanation or reference to one. Your answer suggests that you do not think your curves are that accurate; but when I plotted them on Mathcad I am definitely not getting the minimum on Nov 12. This leads me to think that your curves are not valid for sunset times. I would dearly like to know what would do the trick. Would I need to use Bessel numbers for greater accuracy? @Alan and Alfred: I was attracted to this topic because it's a nice application of composite trigonometric curves. I'm certainly no expert on where the actual equations come from nor can I vouch for their to-the-second accuracy. Probably the best thing would be to approach the authors of the various papers referenced at the bottom of the Wikipedia article on the Equation of Time. Thanks, Murray. I will do. Is your question related to Equation of Time? Your article and graphs have helped me. Thank you. I am MOST impressed by your very kind and gentlemanly responses to all the comments you have received! the earth is closest to the sun durring winter, movving throu angles very rapidly.SO!, I can now believe sun ries/set times on our our non-geometric clocks, could not coupe I checked this, and was astonished ! ...check this fact decades ago, could never get it. Is the equation of time a constant, irrespective of your Latitude or Longitude? @Rob: The "equation" of time historically was an indication of the difference between what a sundial said the time was, and what the actual time should be, considering Earth's axis title and elliptic orbit. The sundial was already designed for a particular latitude; the differences were applied to the time given by that actual sundial.